I recently returned from Kansas City, a locale well known for its barbecue, and a wonderful visit with good friends. During one of our conversations, I mentioned that I would be contributing to Cooking in Cast Iron. I cannot say that their response surprised me, but the quizzical looks on their faces got me to thinking about cookware and its owners, as well as the art of cooking. Why is it that I found the idea of Cooking in Cast Iron—both the action and the blog—intriguing? 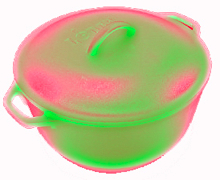 Is something in my brain wired differently when it comes to cookware fixation? Do I find cast iron appealing because its austere appearance hints at is pragmatic nature even as its rougher surface glistens from its seasoning? Do I identify with cast iron because it is sturdy and yet ironically (no pun intended) fragile in some respects? How odd it all seemed to be drawing personality comparisons with this humble medium of food preparation. In fact, I know my friends will both be laughing hysterically upon reading the previous paragraph, and I smile at the thought. During my visit, my friend Caryn took me to a cooking store and we browsed for a good 45 minutes. There was a relatively small end cap in the store devoted to Lodge cookware. I even spotted a cast iron Dutch oven on display, which is a notably larger and more expensive piece. I gazed at the various pieces available and mentally calculated when I would be financially free to indulge myself in the purchase of one following the vacation. Despite my interest in this particular section in the store, my friend was unmoved and unmotivated to break out any cast iron over the weekend. Again, I pondered the difference in her approach and my own. Is having a favorite cast iron pan akin to having a favorite coffee mug? Is there a psychology behind one’s attachment to the medium? In the end, perhaps our preferences for method and medium are really products of long-established habits. This evening I heard a song on one of my son’s cartoons that speaks volumes on this issue. The song emphasized that the way you do something doesn’t have to “be by the book.” The characters in the cartoon were cooking, among other things, and were shown improvising when they didn’t have all of the ingredients or all of the necessary components to complete a recipe or task. When it comes to cooking, I have always favored improvisation that is built on a fundamental knowledge of how ingredients are meant to work together. I’ve often contemplated and experimented with ingredient combinations, but now I am thinking about the instruments with which I cook those ingredients, as well. 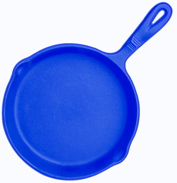 Using cast iron to cook has so many well-established advantages, including its non-stick features, its durability, its relatively even cooking, and its contribution of iron to our diets, and I am drawn to the notion that perhaps the incorporation of cast iron into the cooking experience also makes it more natural in some respects. Perhaps I am not able to prove this speculation (nor do I really perceive a need to do so at the moment), but I have to wonder if the instruments we cook with define us as much as what we are ultimately preparing and how we go about assembling it . After all, artists and artisans are quite selective about their instruments and implements. These individuals understand the value of the tool to the craft. It only seems appropriate that those developing their skill in cooking would opt to select the best instruments, as well. Feel free to leave your thoughts in the comments below, or you can contact Leila directly at leila@cookingincastiron.com.